When the first Polynesians arrived in New Zealand some time before 1300 AD, they would have been amazed by the number of seals. Living in large colonies on the rocky shore, seals were easy to find. Their meat was delicious, their fur made warm clothing, and their teeth were used for fish hooks. So many were killed that most colonies disappeared. However, in the 1700s there were still thousands of seals in the waters around Southland and the West Coast. Early European explorers or visitors, arriving in sailing ships, caught seals for food, fur and oil. In 1773 Captain James Cook anchored at Dusky Sound in Fiordland, where his crew killed some seals. He wrote that the meat was as tasty as beefsteak. Soon, traders in Australia were sending groups of sealers to New Zealand. In one year, a sealing gang collected 4,500 sealskins. People in Britain wanted sealskin hats and coats, and the leather for shoes. Seal oil burned cleanly, and was used in lamps. After 1803 many sealers worked in New Zealand and on remote islands in the Southern Ocean. They killed hundreds of thousands of seals. Sealers had a tough life, and they were lonely – at first, there were very few other people where they were working. Six or eight men would be dropped off at a deserted coast and left for months. They lived in caves or under boats, and were always cold and wet. They survived on hard biscuits, seal meat and fish. The work was dangerous. The men would hunt at night, and many slipped on the rocks and drowned. Using clubs, they would quickly kill all the seals in a group. Then they would take off the skins and hang them out to dry. 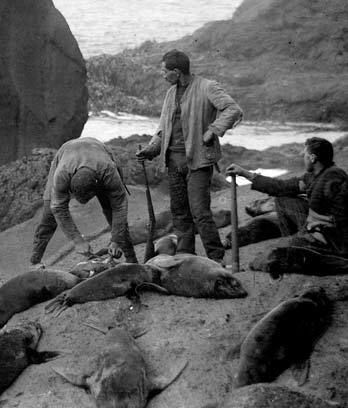 The number of seals dwindled, and by the 1830s many sealers had started trading in potatoes or flax. In 1875 the government passed a law to protect seals.